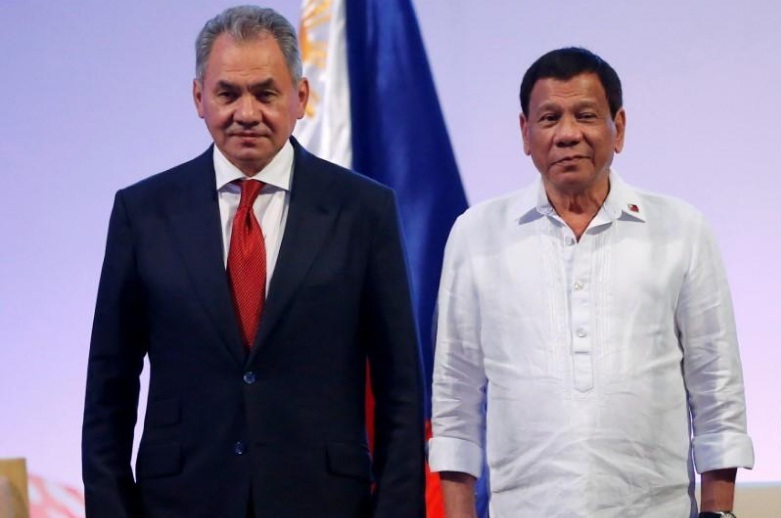 Philippine President Rodrigo Duterte stands with Russia's Defense Secretary Sergei Shoigu (L) during a courtesy call at the 11th Association of Southeast Asian Nations (ASEAN) Defence Ministers' meeting at Clark Field in Pampanga province, north of Manila, Philippines October 24, 2017. MANILA - Thousands of assault rifles and helmets were among the military gear Russia donated to the Philippines in a bid to widen its arms market in Southeast Asia at a time when Manila is seeking to diversify weapons systems, officials said on Wednesday. The gift came a day after Russia and the Philippines signed two military pacts, including a sales contract with Rosoboronexport, a state-owned vendor of Russian defense equipment. Lorenzana said the Rosoboronexport contract was not a sales deal but signaled the Philippines’ intention to acquire small arms, vehicles and special equipment for disaster operations. Since 2000, the United States has donated close to $1 billion worth of military equipment to the Philippines, ranging from surveillance planes, drones and boats to small arms. The deals with the Philippines will allow Russia to expand its arms market in the region, said another senior Philippine official, who declined to be named because he was not authorized to speak to media. Thousands of assault rifles and helmets were among the military gear Russia donated to the Philippines in a bid to widen its arms market in Southeast Asia at a time when Manila is seeking to diversify weapons systems, officials said on Wednesday. Manila received about 5,000 Kalashnikov rifles, 5,000 steel helmets, about a million rounds of ammunition for the rifles and 20 army trucks in a ceremony attended by President Rodrigo Duterte, who also toured one of five visiting Russian warships.